There are a number of different ways to recover a lost Windows password by using something like Ophcrack which lets you to crack the hashes with rainbow table. However, this is also the most difficult method and can be very time consuming depending on the length of your password. Instead of recovering the original password, you can reset a forgotten Windows login password instantly. In this tutorial I’ll show you how to reset lost Windows 8 password on a brand new HP ProBook 430 G2 Notebook with PCUnlocker. How to Reset Windows 8 Login Password on HP ProBook Notebook? PCUnlocker is a bootable program that needs to run from a bootable CD or USB drive. After you’ve downloaded the PCUnlocker program, unzip the downloaded file and you’ll get an ISO image: pcunlocker.iso. Burn this ISO file to a blank CD or USB thumb drive with ISO2Disc. Once you’ve created a PCUnlocker Live CD/USB drive, you can now bring it to unlock your HP ProBook notebook. Put the CD in the optical drive or plug the USB drive into the USB port of your HP ProBook laptop. When powering on the laptop, repeatedly press the Esc key to enter the Startup Menu, and follow the prompt to press F10 to enter the BIOS Setup. After you’re in the BIOS Setup, navigate to System Configuration > Boot Options. 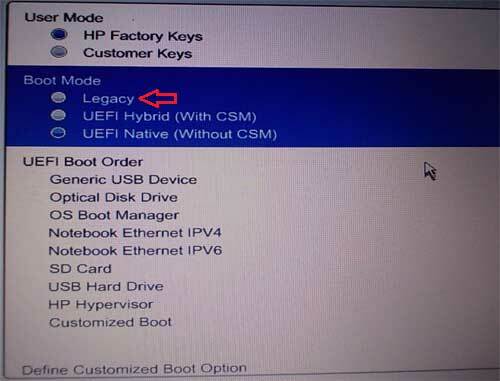 Disable the Secure Boot option and change the Boot Mode from “UEFI Native (Without CSM)” to Legacy. Save your changes and exit the BIOS. When your computer is restarting, repeatedly press the Esc key to access the Startup Menu again. Press F9 to enter Boot Device Options, from which you can choose to boot from a CD or USB drive. Once booted into PCUnlocker Live CD/USB drive, the computer will temporarily load the WinPE OS and take you to the PCUnlocker program. From there you can see a list of local accounts for your Windows 8 installation. In my example, I use a Microsoft account as my computer’s login, and you can see my email address in the Description column of the “Boris” account. Choose a local account and click on Reset Password button, it will unlock / reset your forgotten Windows 8 login password immediately. Here I choose the “Boris” account and the program assigns a new password (Password123) to my Microsoft account, that is because Windows 8 doesn’t accept a blank password for a Microsoft account. The last step is restarting your HP ProBook notebook and removing the CD/USB drive. Enter into the BIOS Setup again and change the Boot Mode back to UEFI. After that, you can boot into Windows 8 with a blank password for a local account, or log in as Microsoft account with the new password. That’s it! I have tried everything to get into my laptop. The password I had set up will not work for some reason. Is there anyway I can bypass or recover the password? This is a newly-purchased HP 2000 laptop with Windows 8 pre-installed on it. Forgot Windows 8 login password for your HP 2000 laptop? You can reinstall Windows and start over, but installing Windows is a time-consuming task and it may also cause data loss. So the easiest and intelligent solution is by recovering Windows 8 password. All you need is a boot media. First of all, you need to make a PCUnlocker Live CD using an alternate PC with Internet connection. Download the ISO image of PCUnlocker and burn it to a CD using your preferred CD/DVD burning tool. If you don’t have one, ISO2Disc is a good option which allows you to make a bootable CD or USB drive from an ISO image. Now you can use the CD to recover Windows 8 password on your HP 2000 laptop. To get your laptop to boot from the CD, you need to change the boot order and disable UEFI Boot option in BIOS. Insert the CD into the disc drive and turn on the computer. As soon as you see the BIOS splash screen, repeatedly press F10 to enter into BIOS Setup. Navigate to the System Configuration tab, and move to the Boot Options and press Enter. You need to disable Secure Boot and enable both Legacy Support and CD-Rom Boot options from there. At the bottom of your screen, you can find the Legacy Boot Order section. Move the Internal CD/DVD ROM Drive to the top of the bootable devices. Save your changes and exit BIOS Setup. This time your computer will automatically boot from the CD you’ve just burned. 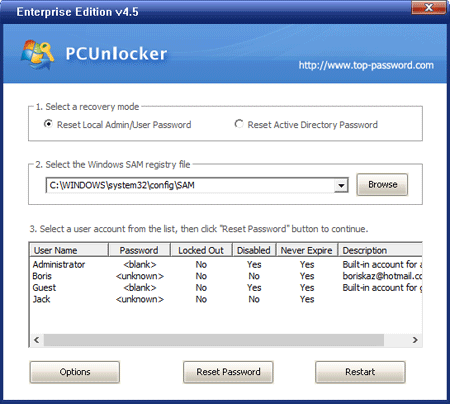 Just after one or two minutes, the PCUnlocker program will start and it shows you a list of local accounts for your Windows 8 installation. Choose a user account and click on Reset Password button. It will remove / unlock your forgotten password instantly. If you try to reset password for the local account associated with your Microsoft account, the program will assign a new password which could be later used to sign in your Windows 8 Microsoft account. The next step is remove the CD and restart the computer. The computer will continue to boot in Legacy BIOS mode and you can revert the changes that you have made in BIOS Setup. When you come to the Windows 8 login screen, you can log on the system with a blank password for your local account, or a new password for your Microsoft account. You can also follow this step-by-step guide to recover Windows 8 password on Dell, Lenovo, Toshiba, Sony, Acer, or any other UEFI-based laptops or desktops. 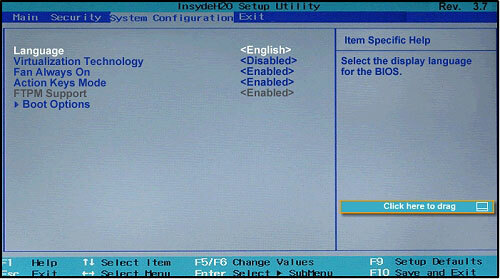 But each motherboard and/or computer manufacturer utilizes a different BIOS, you need to find the indicated key to enter into BIOS and disable UEFI boot on your own computer. Forgot Windows 8 admin password on your HP laptop? 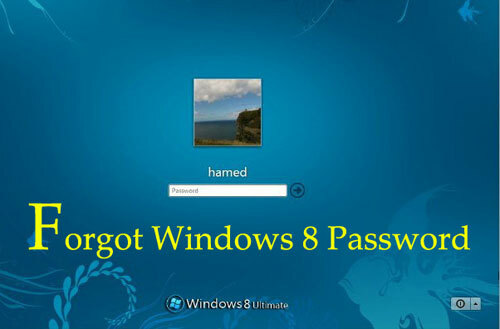 How to reset HP login password to your Windows 8 system running in UEFI mode? If your HP computer comes with the new type of firmware UEFI instead of traditional PC BIOS, you will soon find out that most of boot CDs don’t support UEFI boot. However, there is a quick fix to this problem. 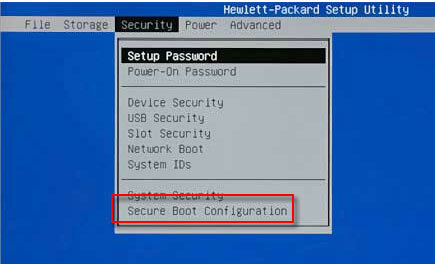 In this tutorial we’ll walk you through how to reset forgotten administrator password on any HP computers with Windows 8 pre-installed in UEFI boot mode. How to Reset Forgotten Windows 8 Admin Password on HP Computer with UEFI BIOS? First of all, you need to create a Live CD (or USB flash drive) on another PC that you can access. 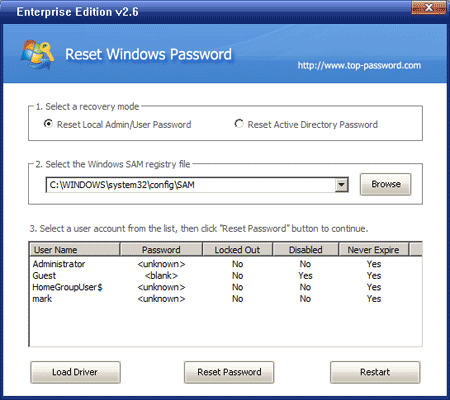 Download the ZIP archive of Reset Windows Password utility and save it on your desktop. Open the ZIP file and extract it to a folder on your desktop. Within that folder, you’ll find a file called ResetWindowsPwd.iso. Burn the ISO image onto an empty CD using ISO2Disc, BurnCDCC or other ISO burning software. Place the Live CD into the CD drive of your locked Windows 8 HP computer. Now we need to make some changes with the computer in order to get it to boot from the Live CD. Power off the computer. 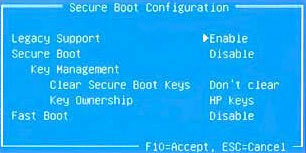 As soon as the HP welcome screen appears, immediately press F10 key to enter the BIOS. Use the arrow key to select Security tab and then choose Secure Boot Configuration. When the Secure Boot Configuration warning displays, press F10 to continue. 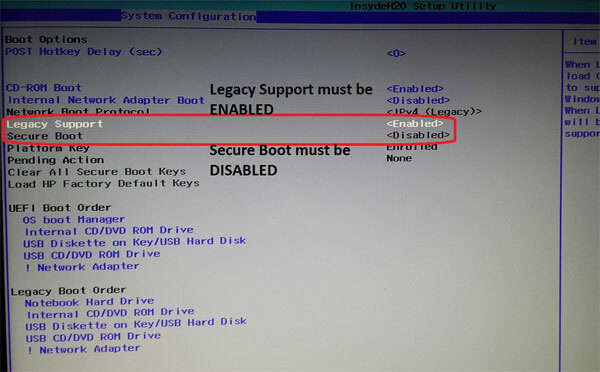 Enable the Legacy Support option if it is disabled, and then disable the Secure Boot option. 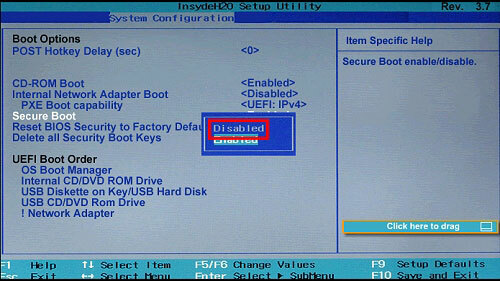 change the boot order to CD/DVD-ROM and press F10 to save your changes. Note: If you are using a HP notebook computer with UEFI BIOS, turn on your PC and repeatedly press Esc key until the Startup Menu opens. Choose the System Configuration menu, use the down arrow key to select Boot Options, then press Enter. Next disable the Secure Boot option. After successfully booting from the Live CD, the computer will open up the Reset Windows Password program after a few minutes. The program automatically searches the Windows SAM registry hive for your Windows 8 installation, and then display all of local user accounts on your HP PC. Choose the administrator account and then click on “Reset Password” button. It will reset your forgotten Windows 8 administrator password instantly. Restart the computer and take out the Live CD from the CD drive. Remember to change your computer’s boot mode from Legacy back to UEFI, otherwise Windows 8 will fail to boot. When the HP computer boots into the Windows 8 login screen, you can then log in to the administrator account with a blank/empty password. It’s that easy!